Professor Peterson runs a top secret medical centre specialising in life saving medical Bio-Printed research. After the funds start to dry up he is approached by a military organisation who offer him the money he needs on one condition. He must use his medical research to create a Tyrannosaurus Rex which the military hope to use in battlefields as a weapon. Upon creating the killing machine it kills several people and the project is shut down only to be resurrected by a shady individual called Andrews several months later. Andrews wants the project to go further, he wants them to create the ultimate weapon by splicing human and Dinosaur D.N.A. together. With this done will the military want what they have created? For a film that only lasts 75 minutes you would think they would want to fill as much of that time with story but over 10 minutes of the film is beginning and end credits, giving you a grand total of 65 minutes of actual film. 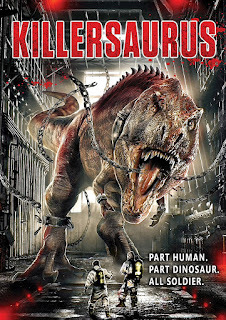 The film isn't bad but due to its budget you get to see ALOT of people talking and very little of the Tyrannosaurus Rex causing havoc in the research centre. Talking of the dinosaur, I was expecting to see a CGI monstrosity but thankfully they opted to not do that, instead we have a puppet which is shot at different angles to make it look bigger then it really is. The ending of the film is rather abrupt and we are just left with the dinosaur in question roaming free in the research centre, it is almost as if they didn't know what to do so just quit filming there and then. The acting is fine from every one but the most life comes from the puppet dinosaur! This is obviously a low budget film shot in a small frame of time with a skeleton crew so they must be commended on making something that is fun to watch if a little slow in places.